o-Succinylbenzoyl-CoA (OSB-CoA) synthetase (MenE) is an essential enzyme in bacterial vitamin K biosynthesis and an important target in the development of new antibiotics. It is a member of the adenylating enzymes (ANL) family, which reconfigure their active site in two different active conformations, one for the adenylation half-reaction and the other for a thioesterification half-reaction, in a domain-alternation catalytic mechanism. Although several aspects of the adenylating mechanism in MenE have recently been uncovered, its thioesterification conformation remains elusive. 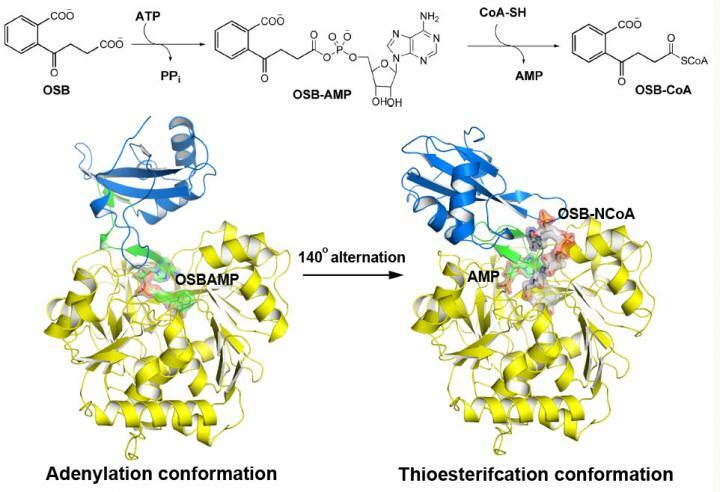 Using a catalytically competent Bacillus subtilis mutant protein complexed with an OSB-CoA analogue, researchers from the Hong Kong University of Science and Technology revealed a thioesterification active site specifically conserved among MenE orthologues and a substrate-binding mode distinct from those of many other acyl/aryl-CoA synthetases. Several residues that specifically contribute to the thioesterification half-reaction without affecting the adenylation half-reaction were identified, and they also observed a substantial movement of the activated succinyl group in the thioesterification half-reaction. Their findings were published in the Journal of Biological Chemistry on July 21, 2017 (doi: 10.1074/jbc.M117.790410). "Our findings provide new insights into the domain-alternation catalysis of a bacterial enzyme essential for vitamin K biosynthesis, and of its adenylating homologues in the ANL enzyme family," said Zhihong Guo, an associate professor at the Department of Chemistry of HKUST. "Our work validated the hypothesis that a distinct substrate binding mode is unique to this enzyme." As a member of the ANL enzyme family, OSB-CoA synthetase (MenE) is a valuable drug target in the vitamin K biosynthetic pathway, but little is known about the structure of the enzyme yet. "We have constructed high-resolution crystal structures of a catalytically competent double mutant (IRAK) of bsMenE in complex with a stable product analogue, OSB-NCoA, and a combination of OSB-NCoA and AMP," said Guo. "In addition, these crystal structures revealed the amino acid residues contributing to recognition and binding of the substrates and products in the thioesterification reaction. These results have not only provided unambiguous support for the domain-alternation catalytic mechanism of ANL enzymes in general; they have also revealed the unique thioesterification active site of OSB-CoA synthetases and provided the structural basis for their catalysis of the thioesterification reaction to facilitate their utility as a drug target." "Our findings provide fresh insights into the domain-alternation mechanism of the essential vitamin K biosynthetic enzyme and its homologues in the ANL enzyme family, and will help us build a protein catalytic cycle in a continuous manner, which no one has done before."